Lisa Perez grew up here in Odem and is an Odem Graduate from class of 1992. After high school graduation she married her high school sweetheart and left Odem with her husband who was in the United States Air Force. Together they lived in New Jersey, Okinawa Japan, and New Mexico before finally coming back to live in Odem in 2001. She received her Registered Nursing Degree from Del Mar School of Nursing in 2003. After receiving her Nursing License she worked at Northwest Regional Hospital and Spohn Shoreline before accepting a position as a School Nurse at Odem-Edroy ISD. 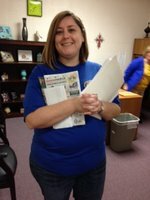 She has been a school Nurse at Odem-Edroy ISD for 13 years and is presently the District Nurse. She has been married for 24 years and has 2 children who are both ODEM OWLS!!!!!! !